The Information Warfare Division was formed in July 2017 as a result of the formation of the Australian Defence Force Headquarters. Headed by the Deputy Chief Information Warfare, the Division consists of four branches – Information Warfare Capability, C4 and Battle Management Capability, Capability Support Directorate and the Joint Cyber Unit. 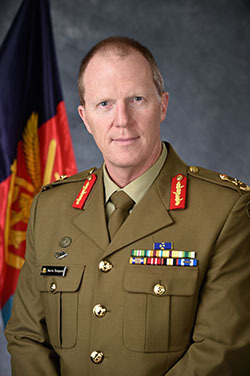 Major General Marcus Thompson graduated from the Royal Military College, Duntroon, in 1988 and spent his early years in the Royal Australian Corps of Signals. He has deployed on a number of overseas operations and commanded at every level from Troop to Brigade. Major General Thompson was recently appointed as the Head of Information Warfare for the Australian Defence Force. Major General Thompson was appointed a Member of the Order of Australia in the 2014 Queen’s Birthday Honours List. He holds a Bachelor of Electrical Engineering with honours from the University of New South Wales, a Bachelor of Business from the Royal Melbourne Institute of Technology, a Masters Degree in Defence Studies from the University of Canberra, a Masters Degree in Strategic Studies from Deakin University, and a PhD in Cyber Security from the University of New South Wales.